Kenoplumbomicrolite: Mineral information, data and localities. Named according to the pyrochlore supergroup nomenclature (Atencio et al. 2010). 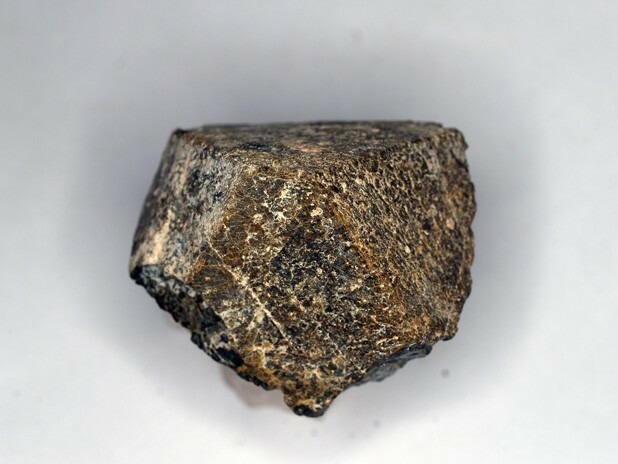 Keno is Greek for empty, for the vacant ionic position, plumbo is derived from the Latin for lead, and the microlite part of the name is for the relationship to that mineral group. Orginally published as a possible new species; published structure determination ( Atencio et al. 2010, Christy et al. 2013). Approved by IMA as a valid, new species in 2016. Stepanov, V.I., Bukanov, V.V., Bykova, A.V. [Степанов В.И., Буканов В.В., Быкова А.В.] (1982) Plumbomicrolite from amazonite pegmatite of Ploskaya Mountain - first find in USSR [Плюмбомикролит из амазонитового пегматита горы Плоской - первая находка в СССР]. Dokl. Akad. Nauk SSSR [Докл. Акад. Наук СССР]: 263 (1): 183-185 (in Russian). Bindi, L., Zoppi, M., Bonazzi P. (2006) Plumbomicrolite from the Ploskaya Mountain, Keivy Massif, Kola Peninsula, Russia: composition and crystal structure. Per. Mineral. : 75(2-3): 51-58. Atencio, D., Andrade, M.B., Christy, A.G., Gieré, R., Kartashov P.M. (2010) The pyrochlore supergroup of minerals: nomenclature. Canadian Mineralogist: 48: 673-698. Christy, A.G., Atencio, D. (2013) Clarification of status of species in the pyrochlore supergroup. Mineralogical Magazine: 77: 13-20. Bindi, L., Atencio, D., Andrade, M.B., Bonazzi, P., Zoppi, M., Stanley, C.J., Kristiansen, R. (2016) Kenoplumbomicrolite, IMA 2015-007a. CNMNC Newsletter No. 33, October 2016, page 1143; Mineralogical Magazine: 80: 1135–1144. Atencio, D., Andrade, M.B., Bindi, L., Bonazzi, P., Zoppi, M., Stanley, C.J., Kristiansen, R. (2018): Kenoplumbomicrolite, (Pb,□)2Ta2O6[□,(OH),O], a new mineral from Ploskaya, Kola Peninsula, Russia. Mineralogical Magazine, 82 (in press). Stepanov V.I., Bukanov V.V., Bykova A.V. [Степанов В.И., Буканов В.В., Быкова А.В.] (1982): Plumbomicrolite from amazonite pegmatite of Ploskaya Mountain - first find in USSR [Плюмбомикролит из амазонитового пегматита горы Плоской - первая находка в СССР]. Dokl. Akad. Nauk SSSR [Докл. Акад. Наук СССР], 263, 1, 183-185 (in Russian); Bindi L., Zoppi M., Bonazzi P. (2006): Plumbomicrolite from the Ploskaya Mountain, Keivy Massif, Kola Peninsula, Russia: composition and crystal structure. Per. Mineral., 75, 2-3, 51-58; Atencio D., Andrade M.B., Christy A.G., Gieré R., Kartashov P.M. (2010): The pyrochlore supergroup of minerals: nomenclature. Can. Mineral., 48, 673-698.